The House of Commons agriculture committee in Ottawa is debating a Conservative motion to compel testimony from Foreign Affairs Minister Chrystia Freeland, International Trade Minister Jim Carr and Agriculture Minister Marie-Claude Bibeau to address what they say is a broader political crisis with China that's affecting the livelihoods of Canadian farmers. A Quebec Conservative MP is calling China's decision to ban canola imports from Canada "absurd." Tory MP Luc Berthold shot back at China during a meeting Friday of the House of Commons agriculture committee in Ottawa. The committee is debating a Conservative motion to compel testimony from Foreign Affairs Minister Chrystia Freeland, International Trade Minister Jim Carr and Agriculture Minister Marie-Claude Bibeau to address what they say is a broader political crisis with China that's affecting the livelihoods of Canadian farmers. China's decision to ban $2 billion worth of Canadian exports is widely seen as retaliation for Canada's arrest of Meng Wanzhou, an executive with Chinese telecom giant Huawei, at the behest of the United States. Saskatchewan Conservative MP Randy Hoback said the cabinet ministers need to provide "comfort" to farmers by assuring them they'll have a market to sell to this fall. China says it has found hazardous organisms in the shipments of two major canola exporters, Richardson International Ltd. and Viterra, Inc.
China was infuriated by Meng's Dec. 1 arrest on a U.S. extradition warrant alleging fraud. Nine days after Meng's arrest, China imprisoned two Canadians — ex-diplomat Michael Kovrig and entrepreneur Michael Spavor — and accused them of violating China's national security. 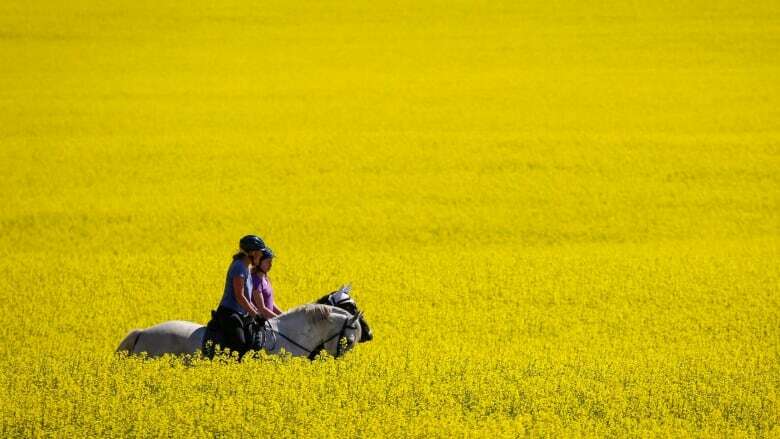 The Canadian Chamber of Commerce says China's canola decision has no basis in scientific fact. Mark Agnew, senior director of international policy for the chamber, says he trusts the assessments by Health Canada and the Canadian Food Inspection Agency that Canada's crop is safe. Agnew, however, stopped short of linking the arrest with the canola issue. "When you look at the numbers the canola industry has put out, there's a massive market here that looks like it's being shut off for Canadian canola exporters," Agnew said Friday in an interview. "We trust what Health Canada and CFIA say about the safety of Canadian exports. It's quite easy to see there's not a science-based justification for what China is doing to Canadian canola exports." Berthold denounced the Chinese complaints about the quality of Canadian canola. "To claim the canola sent to China didn't meet quality standards is completely absurd," said Berthold. "We need a solution fast." China is the recipient of about 40 per cent of Canada's exports of canola seed. China is the only country to raise a technical issue with the product. Canadian farmers say China's ban has created uncertainty ahead of the spring planting season. Along with the Canola Council of Canada, they are calling on the government to send a delegation to China to address the issue. Earlier this week, Trudeau mentioned the possibility of sending a delegation to China, as he defended the quality control of the product as "top-notch and world-class." Hoback warned that unless the government can repair the damaged relationship with China, other sectors could be vulnerable to retaliation, including maple syrup and seafood. Earlier this week, Chinese Foreign Ministry spokesman Geng Shuang said China's actions on canola were "scientific and reasonable." Geng said Canada should "take practical measures to correct the mistakes it made earlier" in the bilateral relationship.